When you defend a snow-fort, or “snow-trench” to be modern, you not only want to keep the enemy’s attacking party at a distance by well-a’ ed snowballs, but also to escape from being hit by their snowballs. By building the walls of your fort or trench breast high, you need to expose only your head and shoulders when throwing, and you can quickly “duck” behind the wall when you see a snowball coming. But the author well remembers how the lads attacking a snow fort used to wait for the defenders’ heads to appear — in fact, got to know just when they would appear, — and “soaked” them before there was a chance to get into a throwing position. Probably you have had the same experience. Although this adds excitement to a snow fight, the fun is all on the side of the boys attacking. By the use of periscopes, however, the defenders can have the advantage on their side. 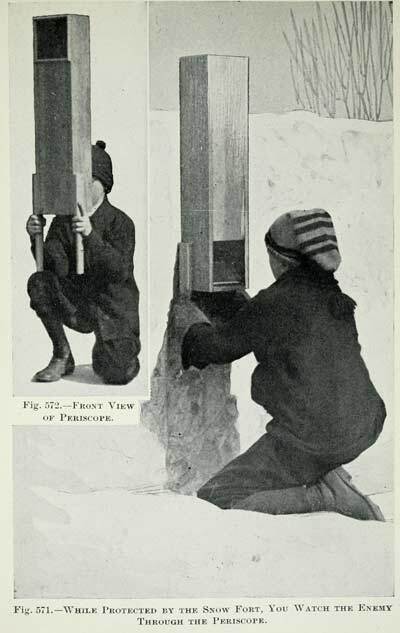 original title: A Snow-fort Periscope / Excerpt from the book: “Carpentry & mechanics for boys: up-to-the-minute handicraft” by Hall, A. Neely (Albert Neely), Publication date 1918 / Publisher Boston: Lothrop, Lee & Shepard Co. Figure 571 shows a rear view and Fig. 572 a front view of the home-made periscope in use, Fig. 573 shows a working detail of the completed periscope, and Fig. 577 shows a vertical section. Boards 5/8-inch thick were used in making the periscope model illustrated, but even thinner boards than this will do. The lighter the weight is, the easier it will be to handle the periscope. Perhaps you can find a packing-box made of 3/8-inch boards which you can break up for the purpose. Those used for the model were bought at 5 cents apiece at a 5-and-io-cent store. They are 5 inches wide and 6 inches long. Get the mirrors before you construct the periscope box, because if they don’t measure 5 inches wide and 6 inches long you will have to alter the dimensions of the side pieces to suit them. After cutting side pieces A, the front and back pieces B, and the ends C (Fig. 573), by the patterns of Fig. 579, cut eight narrow strips (D, Fig. 579) for cleats on which to support the edges of the mirrors. These strips may be cut out of cigar-box wood. Fasten the strips with brads to sides A at an angle of 45 degrees, placing a pair at each end, just far enough apart so the mirrors will slip between them, and so the ends will be far enough away from the edges of sides A to allow for the thickness of the front, rear, and end boards which are set against them. It is absolutely necessary to place the strips at one end exactly parallel with the pair at the opposite end, so that the reflecting surfaces of the mirrors will be parallel with one another, and, also, to place the strips on one board at the same height as those on the other board. Fasten the strips to one board, first, then use the same measurements for locating the strips upon the other board.